My watercolor classes begin this week in Melbourne, Florida! I taught for several years in the Metro Detroit area of Michigan. Since we have moved it has taken a little time to get my classes going, but things are falling into place. Classes are still small right now. From my experience in the past I know they will grow. This is a good time to get in a class with a small number of students. The photo here is of a past student in one of my Friday Morning Drop-In classes that I held in Michigan. We were working on a very large still life painting. Jim always did such beautiful work! 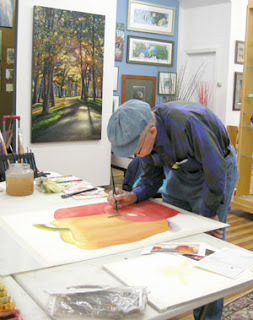 If you would like to know more about my watercolor and drawing classes you can get more information and even register online at: http://watercolorworksart.com/classes. Hope to see you soon.